At SafeGuard Pest Control, we realize that every home and business is unique. That's why we provide our customers with several choices of service plans in order to accommodate their individual needs. But whichever service plan you choose, you can rest assured that you will receive a thorough inspection, professional treatment by a caring experienced technician, and guaranteed results. The One-Time Pest Treatment includes a complete inspection of the home or business to detect signs of infestation, species identification, and problem areas. Our technician will then discuss the findings with the customer, best methods of treatment, and the products and procedures to be used to effectively destroy the existing pest problem. This treatment comes with a 90-day warranty and re-treatment at no charge DURING THE WARRANTY PERIOD. The Quarterly Pest Control Plan begins with a comprehensive inspection of the interior and exterior of the home or business to detect signs of infestation, species identification, and problem areas. Our technician will then review the results with the customer, best methods of treatment, and the products and procedures to be used to effectively destroy the existing pest problem and help protect against re-infestation. With the Quarterly Pest Control Plan in effect, customers will then receive return visits from SafeGuard every three months. This scheduled treatment process enables our technicians to provide year-round maintenance, and to treat any pest problem that may occur. 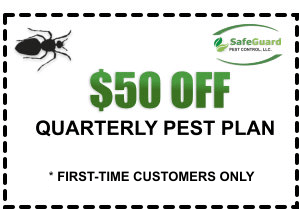 Another feature of the Quarterly Pest Control Plan is that customers receive additional pest treatments as needed between visits at no charge. This plan can be modified to provide monthly treatments for businesses. SafeGuard's Termite Treatment consists of a professional termite inspection. Then, if termite eradication is needed, our technicians will apply the correct termiticide necessary for the particular project externally around the perimeter of the building through the foundation or slab. Upon penetrating the soil, the termiticide will begin exterminating the existing infestation through contact and digestion. The products utilized in out Termite Treatment also possesses residual properties to help prevent future occurrences. 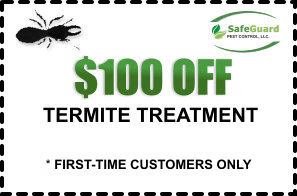 The Termite Treatment comes with a full warranty and FREE annual inspections for the life of the original warranty. Many of our customers prefer a combination of a pest and termite control plan for maximum coverage of their home and/or business property. This combined plan begins with a termite inspection of the premises by our experienced, licensed technician to ensure the structure is free of damaging termites. The termite inspection is followed by a full inspection of the interior and exterior of the premise to detect other types of pests. This also helps define the pest problem and type of treatment our service technicians will provide. Part of this combined plan includes preventative steps to protect customers from future pest problems. Our technicians will discuss the results of their inspections with the customer and provide a schedule of pest control visits that provide ongoing maintenance and future problem resolution when needed. By keeping the Pest & Termite Control Plan current, should termites be detected any residual treatments are fully covered without cost. The most important benefit of a Pest & Termite Control Plan is the confidence and reliability that we will provide services covered under your plan for termites and pests who damage your home or business and create potential for illness or disease. 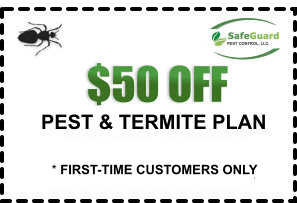 Our Pest & Termite Control Plan is cost-effective and restores the value or a home or business. Our Bed Bug Treatment helps customers become bed bug free. This treatment provides a full inspection and professional treatment of affected areas including crevices and cracks in walls and flooring where bed bugs and their eggs are often found. Our trained technicians will discuss the inspection results, as well as the best method plan for treatment and extermination of bed bugs and their larvae. The Bed Bug Treatment includes a warranty and follow-up service. Rats and mice can turn a home or business into a nightmare and cause disease. Our trained technicians provide interior and exterior premises inspection and detect entry points. We use trapping and eradication methods that remove these rodents indoors and out. This service offers a warranty and follow up rodent control. Homes and businesses located near rivers, lakes and streams are particularly vulnerable to mosquitoes that breed in standing and stagnant water. Our multi-level treatment process involves the use of professional products that attract and kill termites, effectively controlling and inhibiting breeding. This process also invloves treating around structures, shrubbery and trees, up to a level of 20 feet. And, for optimal effectiveness, a 100-foot protective barrier is created and maintained. This process ensures that our customers are able to enjoy the use of their properties without threats of disease-carrying mosquitoes for up to 30 days. Additionally, our monthly mosquito service will guarantee a mosquito-free environment outdoors night and day, all season long.